Indoor gardening is cool! However, selection of best indoor grow tent is a tough task when you start with indoor cultivation. The prime aim of this review article is to deliver some tidbits about top-notch affordable 4×4 grow tents for your next indoor gardening job. So that, you can get better results at a budget-friendly investment. When you start with indoor growing you don’t need to jump directly in the dark with large space or huge grow tents like 10X10 grow tent or 10X8 grow tent. Yeah, it’s always better to start small or moderate so that you can test things at a micro level. And then, you can upgrade your grow space if you need and feel comfortable and confident with growing. So, carry on with us! Also, take a brief look at all these 4 indoor grow tent reviews. As they say, to win hardest battle you need best of the world weapons. Same way, to get best results your need top-rated grow tents. Eco Friendly Indoor Grow Tent. Durable Canvas & Reliable Zippers. Our experts from 420 Expert’s Guide have spent a lot of time in researching and collecting information about the best budget grow tents. After all their efforts they’ve filtered these 4 grow tents for indoor gardening, weed cultivation and hydroponics. Take a brief look at it. The first product on our list is from a famous brand named VIVOSUN. Yeah, the brand is renowned for its quality products and durability. VIVOSUN 48”X48” indoor grow tent is best for anyone who is planning to start with a 4’X4’ grow space along with a decent Viparspectra or Mars Hydro Grow light. 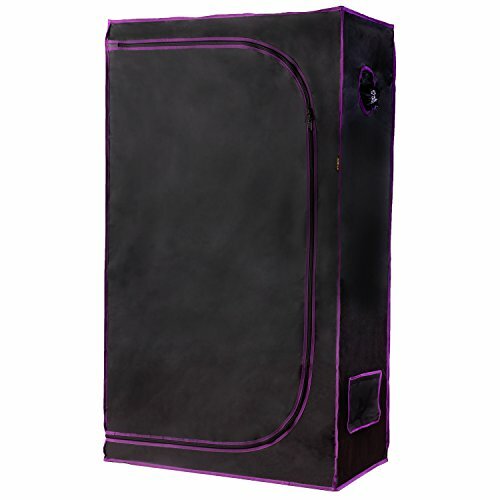 You can read reviews of these 4’X4’ Grow tent compatible grow lights here. As far as grow tent by VIVOSUN is concerned, the first point we’d consider to look at in this review is the quality of its materials. It’s around 6.5’ high concerning dimension and suits well for tall plants as well. VIVOSUN 4’X4’ grow tent is manufactured using high-quality 600D Oxford Canvas materials which are thick in nature and highly durable to serve you in the longer run. Also, Framing materials used in VIVOSUN grow tents is of high-quality metal which plays a vital role in providing sturdy and stable backbone structure to your grow space. You’re supposed to assemble it manually after delivery. However, the assembly is easy and, and you can do it easily by following the assembly manual provided along with grow tent. Now, if we talk about zippers, then zippers are smooth and reliable. It eliminates all the chances of light leakage. For further safety, all the stitching of canvas is double stitched so that it can keep the light in the grow space itself. Inner Mylar materials are highly reflective and provide around 98% light reflection. So yeah, approximately 98% of your light generated by grow panel will revert back to the plants which boost intensity and brightness up to the maximum extent. 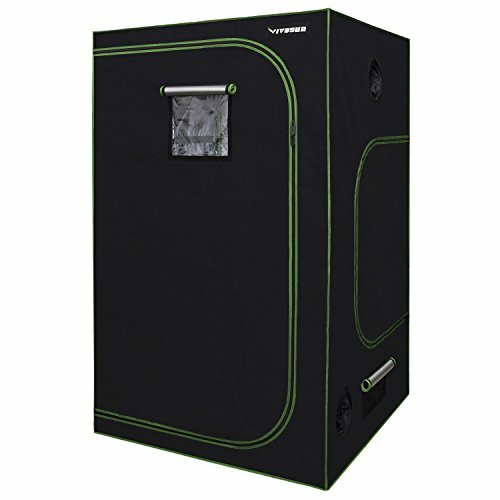 Moreover, you won’t need to open the entire door just to investigate plant progress as grow tent features an observation window on the front. Also, the observation window comes with transparent plastic fabric and a canvas curtain to cover it once you finish the observation. For heat dissipation and air filtration grow tent features several most essential exhaust ducts. To ease cleaning process VIVOSUN grow tent is supplied with a reflective spill proof tray which you can remove and drain excess water in drainage according to your preference. To eliminate all the worries VIVOSUN offers a customer-centric 2 years hassle free warranty to their customers. People planning to start with 4’ X 4’ grow space should hit the buy button now. Yeah, we’re recommending it based on quality it possesses. Also, these 300+ Reviews on Amazon supports our recommendation. We’ve verified all the facts mentioned here by approaching right people who’ve had an experience using it or are currently using it. All we’ve got in our survey was a plain truth that this indoor grow tent is best to start with for anyone. Our second choice is iPower. Yeah, you already might have heard the name of this widely known brand. iPower 36”X36” grow tent is finely finished product for indoor growing as it suits best to 3’ X 3’ grow space with 3-3.5’ tall plants in it. Yeah, it’s 6’ in height, but light placement and some space between light and your canopy is needed, so our compatibility test states that it suits to 3-3.5’ tall plants. Now, if we come to the point of quality, then it won’t disappoint you with its quality material and top-rated reflection results. Yeah, grow tent by iPower is manufactured using high-quality thick canvas materials and for better safety and prevention of light leakage, it is stitched multiple times. Also, smooth and access friendly zippers are of reliable quality and work pretty well for quick access to the inside area of your grow space. Moreover, zippers are supported with protection cover on it which further reduces the chances of light leakage. Now, if we take a look at the frame and structural point then grow tent features long-lasting metallic poles and high-quality fibre cornering clips. Combination of this parts creates stable and failure-free structure for your grow tent. Also, completely assembled grow tent can hold around 110 lbs weight on its frame. Moreover, Interior build of this grow tent features highly reflective Mylar lining which helps in the reflection of light for better growth of your plants by helping your plants to absorb more light. Yeah, regarding figures this grow tent reflects around 92-97% of light generated by your grow lights. For utility purpose, grow tent features tool holding wrong, spill-proof mylar tray and exhaust ducts. Also, easy access window gives you the freedom to take a look at your plants at any point of time without entering into grow space. If you’re worried about assembly, then don’t be so, as iPower 36”X36” grow tent comes with easy to follow visual instruction manual and you have to follow the steps to assemble it. For a safe bet of their customer’s manufacturer offers one year of warranty for their 3’X3’ grow tent. Some users complained about initial zipper accessibility issues. Now, If you’re planning to grow in a 3’X3’ of grow space and expecting a quality product at an affordable rate then iPower 36”X36”X72” is one of the best budget indoor grow tent available on the market. Yeah, quality of canvas, the stability of frame, results obtained by Mylar, accessibility options and well-managed ducts for exhausting heat and filtering air justifies its worth and place in your indoor growing purpose. So, yeah, we’re recommending our readers to go for iPower 3’X3’X6’ grow tent based on the factors mentioned above. What if we say, you can get an eco-friendly and SGS certified grow tent at a highly affordable price? Yeah, it’s possible with Quictent. Quictent 48”X24”X72” grow tent comes with a finely finished canvas and highly reliable frame components. Yeah, Canvas fabric used in this grow tent cover is thick in nature and provides durability to stand up and high for the longer term. And Yeah, Double stitching and high-quality smooth zippers help in eliminating chances of slightest leakage of light from grow space. Moreover, inner PET Mylar lining in the grow tent reflects around 100% of light generated by your compatible grow light. You’re supposed to assemble it manually by following steps mentioned in the instruction booklet provided by the manufacturer. Yeah, it’s easy and user-friendly process. People concerned about frame structure will be glad to know that frame structure is entirely stable and highly reliable. 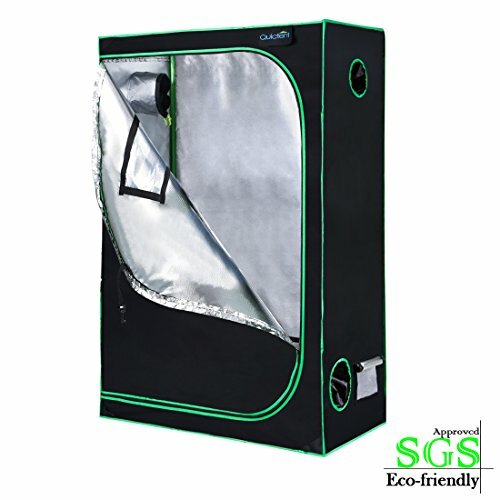 Above all, SGS certified grow tent. It means it has passed several tests conducted by certification authorities. Also, it’s proven that Quictent grow tents don’t release any toxic or harmful gases that harm your plants. Yeah, it is an added advantage. Also, Grow tent dimensions are suitable for a kick starter indoor growing job. However, there are several other variants available by the manufacturer, and you can switch between sizes. For easing you cleaning job, Quictent grow tent features a spill proof tray to drain excess water out of your grow space. Yeah, better results demand a clean and hygienic environment, and that’s what you can provide to your plants using Quictent 4’X2’ grow tent. Also, grow tent offers all these features at an affordable rate. So yeah, you won’t be making a hole at the initial stage of growing. Also, we often recommend our readers to focus on budget initially as later on, you can always upgrade things with ease. Above all, shipping is quick in case you order it from Amazon and Manufacturer also provides 2 years adequate support and warranty policy along with this fabulous piece of satisfaction. Also yeah, we must admit it here that it is one of the best grow tent under 100 dollars on the market. Stitch quality is an issue in a few cases. However, taking help of support will resolve it on sooner time. All in all, this is a definite placeholder for our best indoor grow tent reviews. Moreover, what we loved most about it is a certification by SGS. However, we’re not just relying on this single factor, but all the elements and results justified that we should recommend it our readers and hence we’re recommending it to you in case you’re planning to start with a moderate grow space of around 4’X2’ of the spare area in your house. Name on which you can rely on. Yeah, customer-centric brand doing an excellent job for horticulture and hydroponic since a long time back. If we talk about this specific variant we’re currently reviewing, then it’s a grow tent manufactured by Apollo using high-quality materials as usual. Yeah, Apollo is a customer-centric brand and compromising on quality isn’t their identity. Outer material is of high-quality Oxford 600D canvas fabric and does a pretty great job concerning durability. 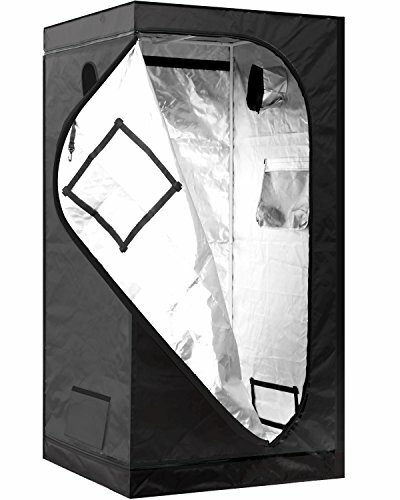 Also, To achieve great results regarding reflection, this grow tent features 96% reflective Mylar lining which reverts all the light towards plants. As we often state, while selecting an Indoor grow tent reflection should be your prime consideration factor because it plays the role of the game winner at the harvest time. As far as weed cultivation is concerned, higher the reflection better the quality and weight. Yeah, that’s what we’ve tested and achieved over the period. Now, if we talk about inner structure and backbone support, then grow tent comes in separate components, and you’ll have to assemble it manually by following assembly guide. Assembly of Apollo grow tent is quite simple and don’t demand any professional skill or tool access in the same. Also, The inner frame structure is supported by high quality and reliable metal poles along with cornering clips you’re supposed to joint each other on the respective place. And Yeah, A crucial part of indoor growing is light conservation. Yeah, grow tent should not be responsible for any possible amount of light leakage. Moreover, in that case, Apollo 36”X60” grow tent wins the streak by providing 100% light proof structure. Yeah, thanks to double stitching and high-quality zippers that keep all the light inside grow space itself. Moreover, Inside grow tent there is a tool holding bag where you can store all your everyday quick access stuff like trimmers and scissors to trim badly leaves and other small tools. However, the manufacturer provides only 90 days warranty, and that could be a down point for a few people’s out there. Moreover, we approached people who’ve taken a chance to start with it and collected all the vital information about Apollo 36” X 20” grow tent. In our survey, we didn’t notice any issues as of now. Yeah, People starting with extra small grow space should take a note of it, that Apollo grow tent especially this variant is the best choice for your indoor growing venture if you’re planning to spend on quality. With quality it , and brand value we’re recommending apollo 36”X20”X62” grow tent to beginners with small grow space. Now, As far as indoor grow tent is concerned, we’ve tried to filter out top notch and best quality products for our readers and came up with this 4 recommendation in our indoor grow tent reviews. Moreover, all 4 grow tent possess the same amount of quality, performance, and reliability ratings. So, it becomes difficult for us as well to recommend any one to our readers as all are best indoor grow tents. However, based on your needs and requirements you can go for anyone out of our mentions. Yeah, like people with small sized grow space should consider going for Apollo variant or Quictent variant. On other hand people with moderate grow space should go for VIVOSUN Indoor grow tent or iPower grow tent.